No-shows and last minute cancellations are the worst. It's an industry-wide problem that Shedul are working towards tackling from the source. By adjusting client expectations, removing hurdles and creating built-in protection for your business, we've found the solution. If you have not set up payment processing for your account already, click here to guide you through. 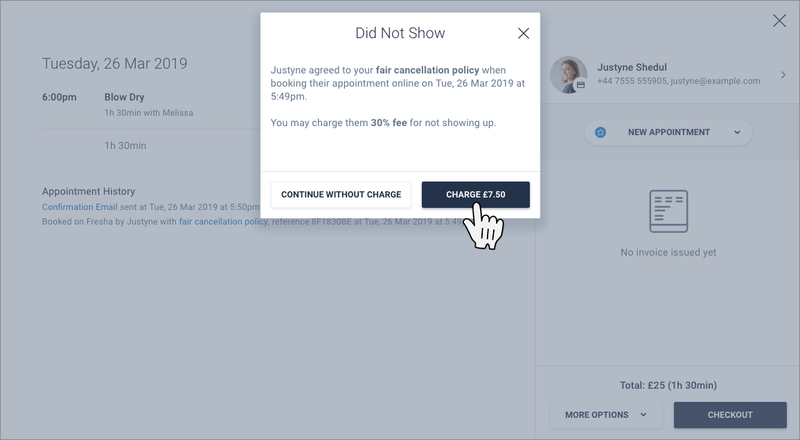 Shedul's no-show and cancellation settings will help you define when and how much will be charged when an appointment is canceled or when you mark an appointment as a no-show. STEP 1 Apply your cancellation notice period. 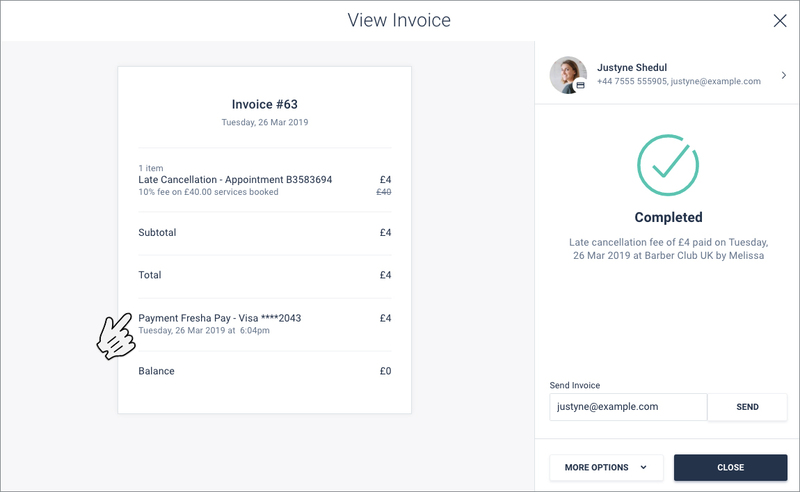 Clients are able to manage their bookings by canceling or rescheduling their own appointments, as long as it is outside of your notice period. 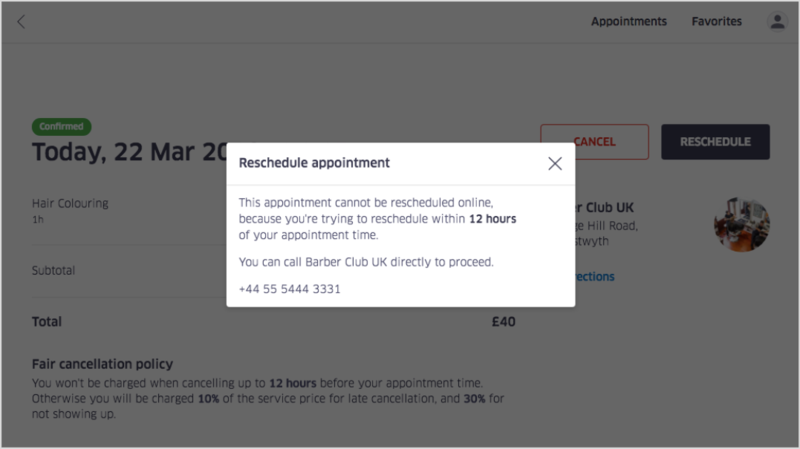 Using the drop-down menu "Clients can cancel or reschedule online"
Example: Setting the cancellation notice period to one hour before will allow the client to cancel one hour before their appointment starts. 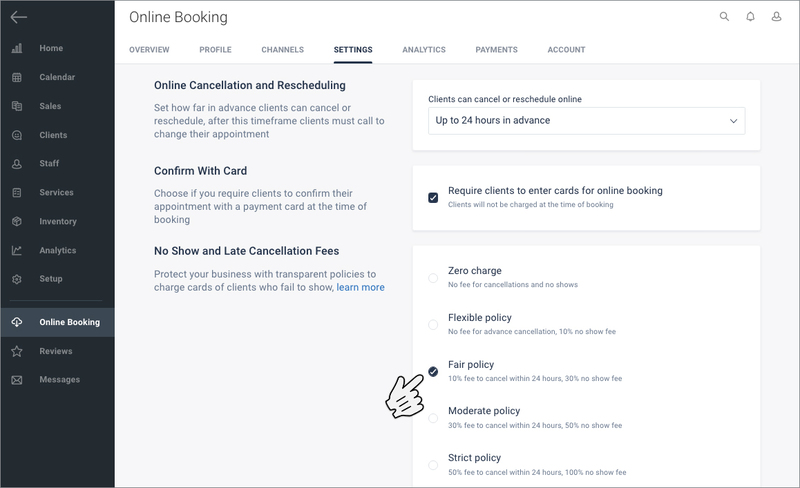 Appointments are static and follow the cancellation rules based on when they were booked. Should your settings change, newly booked appointments will follow the updated cancellation policy. 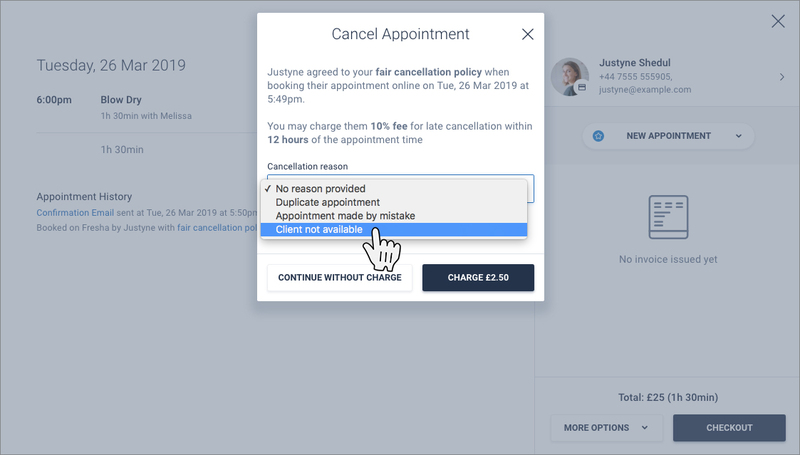 NOTE: Enabling clients to cancel anytime will allow clients to cancel last minute and won't charge them for canceling but will charge them if you mark the appointment as a no-show. TIP: Enable "Require clients to enter cards for online booking" to protect yourself against no-shows and late cancellations. Disabling this will remove the option of setting up no-show and cancellation fees. STEP 2 Apply your No-Show and Cancellation Policy, which will be applied to all of your clients. There are multiple options to choose from to fit your businesses requirements. 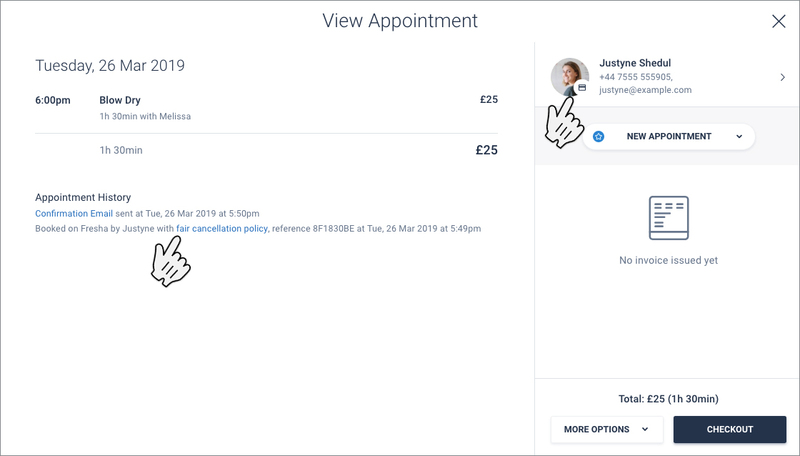 When selecting an appointment you will be able to see which policy was active at the time of booking in the Appointment History. 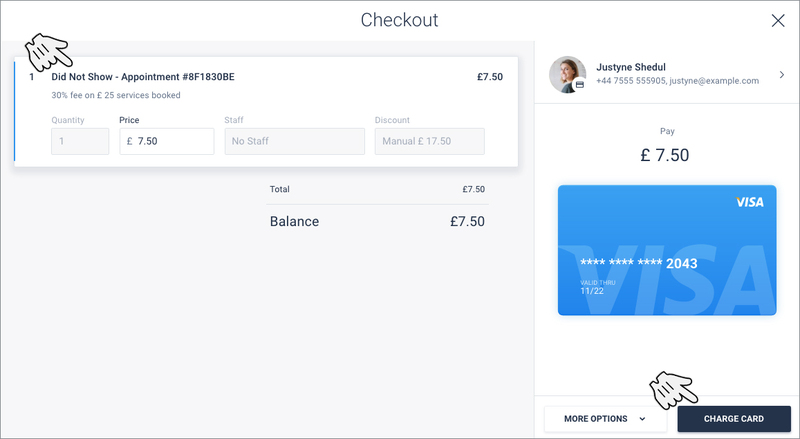 The card icon on the client's profile picture will also be visible if the client's card has been captured while booking online. Should the client call to cancel with less notice than your cancellation policy specifies, the Late Cancellation charge will be applied. Here you can choose whether you enforce your charges or not by either selecting "Continue without charge" or "Charge". TIP: To track custom Cancellation Reasons, head to the main menu for Setup > Cancellation Reasons to create your own. Should the appointment start time have passed already, the option to track the appointment as a No-Show will appear. 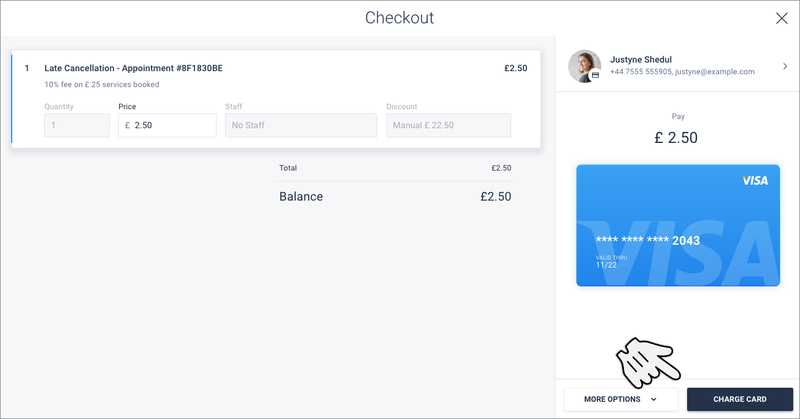 You'll be presented with the checkout screen and the client's stored card details. 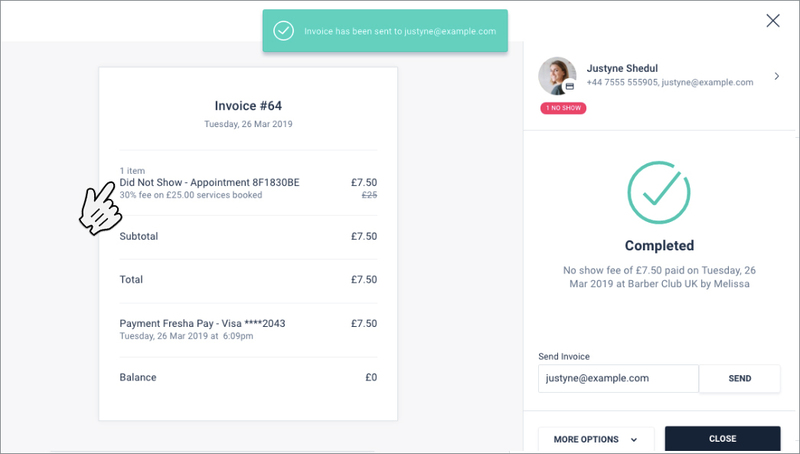 NOTE: Even if the client removes their card details, you'll still be able to charge them for the appointment created during the time when your policy required card capture. 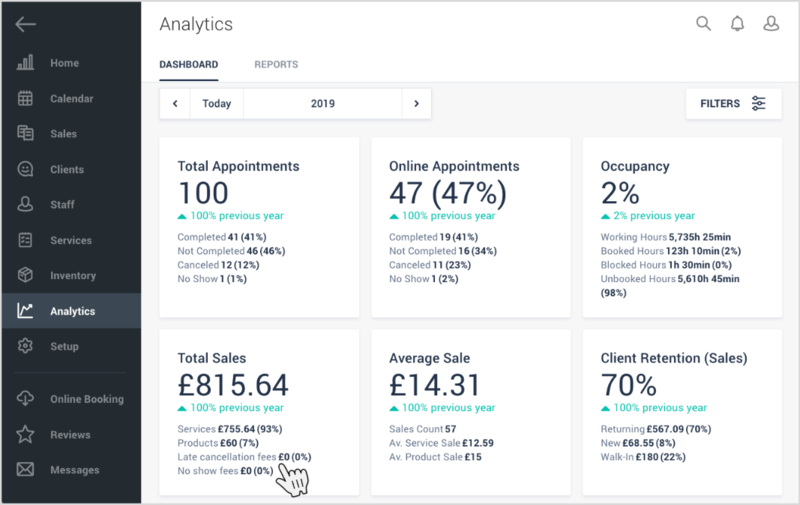 Cancellations and no-show fees appear in multiple sales reports, including the Finance Summary, Analytics Dashboard as well as Sales reports and the Sales Log report. Clients will be exempt from your Cancellation Policy and will not be charged any fees should you reschedule or edit their appointment. Should you try to charge, the authorisation code will be activated. Should the Fresha client reschedule their own appointment, the policy will be updated to reflect the new appointment date and time with the fee structure kept in place. The authorization code only activates when the appointment was booked internally by a staff member or if it was booked online and later edited, given the client has their card details stored. Eg. If the appointment price has increased from £10 to £100, the activation code will apply and the client will need to approve this change by providing you with the code to make this amendment. If the appointment was booked online by the client and the appointment has not been edited in any way, you will be able to charge the client the full no show or late cancellation fee without the authorization code required. This is because the client agreed to your online booking policy whilst booking online, meaning you can charge without any blocks. 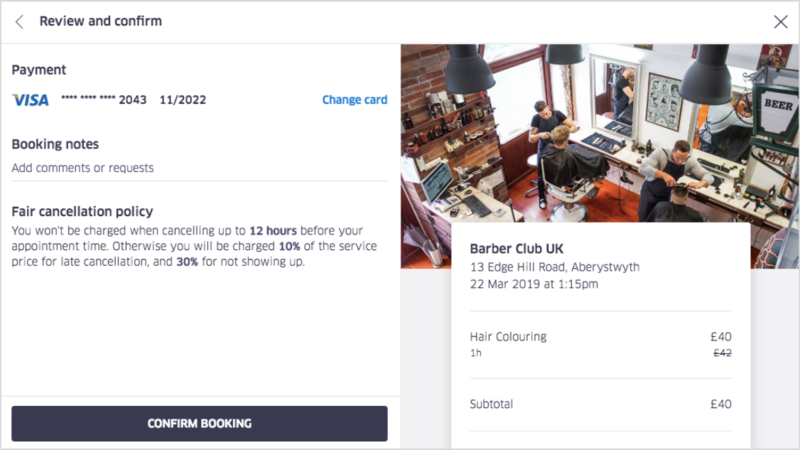 When your client books and your settings have a Cancellation notice period and Card Required applied, they will be presented with your Cancellation Policy before confirming their booking. This ensures the client is fully aware of your Online Booking Policies. Should the client need to Reschedule within less notice than your policy requires, they will be directed to call you. Should the client need to Cancel within less notice than your policy requires, they will be given the option Cancel With Fee or to call you.